Thinking that your home might be a target for criminals is not something that most of us like to dwell on. Yet the reality is, we can never be too complacent. Thieves don’t just want to get their hands on your money and sentimental, treasured valuables, but these days they even want to nab your identity. Protecting your home and being extra vigilant is important to deter any would-be-thief from going near your property. One of the most important strategies for protecting your home is to install a decent security system. It will give you peace of mind and doesn’t necessarily have to cost a fortune. When a burglar is faced with the choice of either trying to break into an alarmed house or one without, it’s a no brainer as to which will be the favoured venue. Fix and repair any cracked or broken windows, as they’ll only present a golden opportunity to a thief to enter your property. Always close and lock windows when you go out. 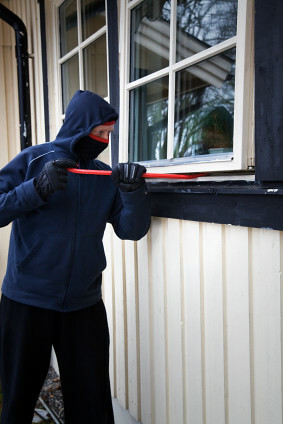 Don’t be fooled into thinking that you can let your guard down on upstairs windows, because the reality is, that if a thief wants to get into your house, shimmying up a drainpipe to get through an open upstairs window isn’t going to put them off. Be extra vigilant when the weather is hot, too. It might seem tempting to throw all the windows and doors open to let the air in, but it could also be an open invitation to any opportunist burglar. Thieves are attracted to empty houses, so when you go out, make your home look as though someone’s still at home. Set lights to come on timer-switches when it gets darker and leave the radio or TV switched on. If you go away on holiday ask a neighbour to keep an eye on your property and move the post on the doormat. An accumulation of letters and bills is an obvious sign that you’re on holiday so don’t give intruders any vital clues. Installing outside security lighting is also a worthwhile measure to deter burglars from robbing your home. Fix lighting at the front, but also at the rear and side of the house. Most people assume that burglars enter via the front, but they’ll get in any way they want. Unruly bushes and shrubs make for great hiding places for burglars and thick tree branches can be used to climb into windows, so maintain your outside greenery and prune it back regularly. Consider planting thorny or prickly bushes near downstairs windows, as this will be very off-putting for anyone trying to break in. Don’t be complacent with the security of your garage and shed. Always keep them well locked, because easy access into a garage or shed provides burglars with tools to get into your house. Keep valuables out of sight, for example, away from windows or on the tops of drawers. You’re only going to be dangling temptation in front of a burglar’s nose. But, avoid hiding valuables in obvious places, such as under the bed or the biscuit barrel. Store personal information in a safe or drawer with sturdy locks, as identity theft is big business in the criminal world. If you’re not already part of one, then why not get a few of the neighbours together to form a local neighbourhood watch scheme? It can benefit everyone involved and create a sense of community. This article was written by Crispin Jones on behalf of Vibrant Doors.